Shopping for toothpaste can be the easiest task or the most challenging. Do you go with what is safe and you are used to or are you adventurous and like to try new things? What I love is when someone can recommend an outstanding product regardless of how long it’s been sitting on a retail shelf. 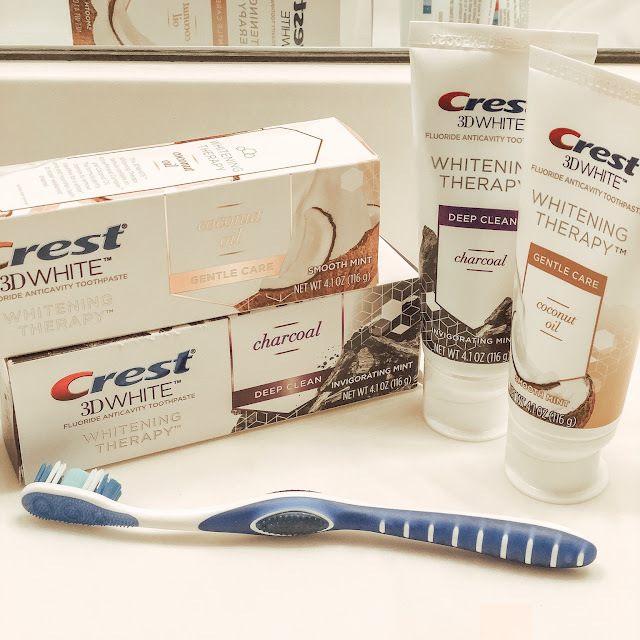 Crest 3D White Whitening Therapy has introduced two new formulas to its existing line and I recently got a chance to review them so hopefully one or both become a staple in your daily routine. We have all seen the very popular videos of people brushing with charcoal infused pastes. The before and after always look great but what most fail to showcase is the mess it leaves on your counter, vanity mirror and all around your sink. After trying the new Crest 3D White Whitening Therapy with Charcoal toothpaste I loved that it provides the amazing benefits of purifying your teeth surface for a whiter, cleaner smile without having to clean your bathroom after the simple task as brushing your teeth. Truly a #BetterWayToCharcoal and perfect for those charcoal lovers looking for a no mess approach! If you are looking to try something completely new test out the Crest 3D White Whitening Therapy with Coconut Oil. My son and I loved its vanilla mint flavor and long-lasting fresh feeling this paste provides. I’ve even included this new flavor in my guest bathroom because I want to get feedback from family and friends spending the night since the flavor might be a little unexpected, but with the same deep clean benefits they expect from Crest. Both new products are available at Target and if you spend $20 you’ll get $5 deal available the week of 3/17. The offer is good on select beauty and personal care items, so shop now to receive your $5 Target gift card.